Knockatagglemore is the 1092th highest place in Ireland. Knockatagglemore is the most southerly summit and also the most westerly in the W Limerick/N Kerry area. TJ Barrington in his 1970's tome 'Discovering Kerry' says that the finest view of the mountains in Kerry is to be obtained from this point. To the north west, the mountains of the Dingle peninsula are on display all the way to the Blaskets and Inis na Bró to the far west. To the north, Castleisland, and on a very clear day, the waves can be seen crashing on Kerry Head. To the south, every hill from Mount Hillary near Mallow to the Mountain Stage near Cahersiveen lies before you, with particularly good aspects of the Paps, Mangerton, Tomies and the Reeks. 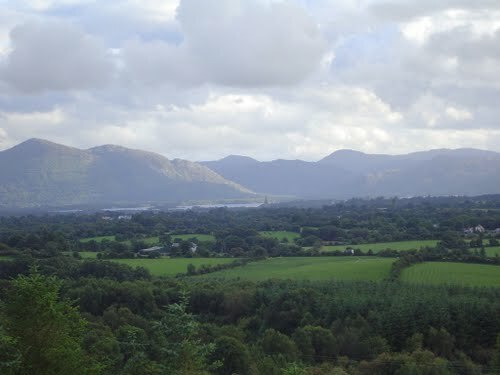 The spires of Killarney and the Lakes beyond are nearby to the south west. If the light is right, Dingle Bay and the sandspit of Inch are clearly visible. In the far distance to the east, can (on occasion) be seen the Ballyhouras and Galtees. This unnamed summit lies on elevated bog that separates the parishes of Kilcummin and Currow, and the baronies of Trughanacmy and Magunihy. This is an ancient division. In the early Christian period, it represented the border between the Ciarraighe Luachra to the north and the Eoghanacht Locha Léin to the south, in the medieval times between the Lordships of the Earls of Desmond and the McCarthys, and in Elizabethan times between the counties of Kerry and Desmond. The summit is also on the approximate dividing line between the cultural area of Sliabh Luachra to the east and south east (known primarily for Gaelic poets of the 18th century and an Irish music genre of the 20th) and the more agriculturally productive areas of mid-Kerry to the west. So if you want some good views and an easy walk through a working bog, this is the one for you.